The ongoing Sûreté du Québec ( SQ ) investigation into financial irregularities at the Town of Hudson is now being handled by l'Unité permanente anticorruption ( UPAC ). Also, the Ministère des affaires municipales des régions et de l'occupation du territoire ( MAMROT ) will soon be conducting an audit of the Town's sewer and water infrastructure project begun some years ago. In addition, the investigation by Revenue Canada and Revenu Québec following Hudson's internal audit which uncovered improper deductions at source on the salaries of its municipal employees continues.
" Hudson is living though a very difficult time in its history, " said the Town's newly-appointed Director General, Catherine Haulard.
" But the Town's employees and myself are working hard to restore Hudson's credibility and re-establish a sense of trust towards the municipal administration. And the response to its financial and operational reform is already underway. " Haulard and Interim Mayor Diane Piacente, along with the council and administration of the Town of Hudson, are working actively with all inquiries, and Piacente and Town Treasurer Sylvain Bernard will continue to meet with UPAC investigators.
" We are all fully engaged in the " heavy lifting " required to reform Hudson's regulatory and procedural processes which have been lacking for so many years, " Haulard said. Most currently, two new bylaws are to be adopted on October 1: Bylaw 634: Budget Control and Monitoring Policy; and Bylaw 635: Reimbursements of Fees by Council and Management for Travel and Meal Expenses. In addition, a purchase order system has been put into place which will take effect October 15. A contractual management policy will also be presented to the new council in November, and further reforms will be instituted in the months ahead. Piacente is spearheading the much-needed procedural and regulatory changes along with Haulard.
" This spring Hudson found itself at a very difficult moment, " Piacente said. "But ever since the first financial irregularities were discovered, council and I have worked extremely hard to improve and reform our procedures in the short time remaining in our mandate. " " We will continue to do all that we can in that ongoing effort. " 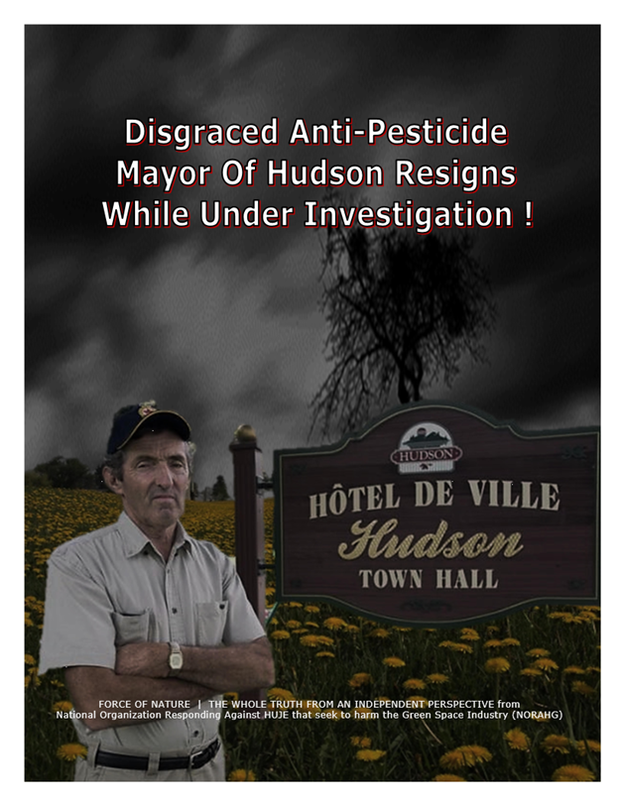 Hudson was/is infested with corrupt crooks and tax-evading criminals who were also, not surprisingly, anti-pesticide extreme-radical left-wing politicians. They stated lies like they were truth, and in a way that made people listen to them. Mayor Michael Elliot, and his lunatic co-conspirator councillors and managers. They were lunatic-liars ! They lied about pesticides. They lied about their personal income tax. They lied about town finances. They lied and lied and lied. Because of their lies, these lunatics annihilated the professional lawn care industry, coast-to-coast. Their lies subsequently created a trail of economic destruction with thousands of people out of work. http://wp.me/P1jq40-43B Their lies discredited Health Canada in order to prohibit products that had been scientifically-approved by the highest quality experts. In fact, Elliott and his co-conspirators were the least qualified to provide any advice about pest control products. Or about simply being honest. Observers are dismayed that these extreme radical left-wing politicians were ever allowed to run for office. They should all be sterilized so that their offspring cannot run for office. Being anti-pesticide equals being crooks all round. NORAHG is the National Organization Responding Against HUJE that seek to harm the Green space industry, and the well-being of our communities. NORAHG is a NATIONAL NON-PROFIT NON-PARTISAN organization that does not accept money from corporations or governments or trade associations, and represents NO VESTED INTERESTS WHATSOEVER.